commercial sugaring operations collect sap through interconnected plastic tubing attached to the maple trees, and the maple-sugaring season typically lasts four to six weeks. 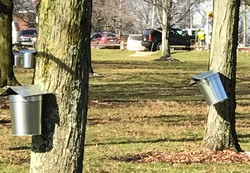 Each year in February the Ohio maple industry begins the process of tapping area maple trees for their sap. Tapping a tree consists of drilling a small hole in the trunk of a sugar maple and inserting a spout. Then attaching a bucket or plastic tubing to the spout where the sap is collected. The weather plays a big part in the type of maple harvest there will be. Cold freezing nights and warm sunny days help the sap in the trees to thaw. As sap pressure builds up in the tree the sap finds its way out. By tapping the tree, the sap has an outlet. The sap is then boiled to remove the excess water. It takes approximately 40 to 50 gallons of sap to produce one gallon of syrup. Depending on the weather, the maple sugaring season lasts from mid-February through the first part of April. Description: See maple syrup being made throughout Ohio. Nearly 40 sugar houses will open their doors and have demonstrations, stuff to do & samples. Come taste the delicious taste of spring in any number of sugar houses an meet the sugar makers. With unique offerings at each stop, you can't go wrong. For drive-it-yourself trail click here. "Join us for a look at how we make our maple syrup, wagon rides around camp, and free sausage and pancakes served with our fresh maple syrup from noon until 3pm." Live entertainment. Maple product samples. Location: Events Barn at the Frostville Museum, 24101 Cedar Point Rd. Located at the corner of Lewis and Cedar Point Rd. in the Cleveland Metroparks Rocky River Reservation. or visit the website www.olmstedhistoricalsociety. org. Adults $7.00, Children 10 & under $5.00. Menu 1 includes unlimited pancakes, juice, hot beverage and sausage. Menu 2 includes Scrambled eggs, sausage, potatoes (no refills), juice & hot beverage. Add’l sausage 3 for $1.00, add’l orange juice $.50. Take out available. Spring has sprung, the sap is flowing, bring your family out to celebrate the season at Stratford! Start the day with a farm fresh breakfast of home-made whole wheat pancakes, Stratford sausage and local maple syrup. Then enjoy a hike along the creek to the sugar shack learning all about the sugaring process. Don't forget to visit the farm animals. There may be a new lamb in the barn! The Museum includes artifacts and early accounts of maple sugaring beginning with the native Americans and continuing through to the modern day, with explanations of the tapping, collection, and boiling processes. You will learn about the old-fashioned sugaring parties, the success of Ohio maple producers at the 1893 World's Fair, the Geauga County Maple Festival, the families of the county who have produced the product for generations, as well as the identities of the today's leading maple syrup makers, the businesses and industries that have supported maple syrup production, and profiles of the Ohio Maple Hall of Fame members. A variety of art depicting the lore and intrigue of maple sugaring will be displayed. There will be a number of children's activities, from reading, to hands-on projects, to search-and-find challenges. Families with youngsters are encouraged to attend. Menu includes all-you-can-eat pancakes served with the Society's own maple syrup, scrambled eggs, sausage, apple sauce, and a beverage. Cost is $8 for adults, $5 for children ages 5 to 12 years old, and free to children 4 and under. 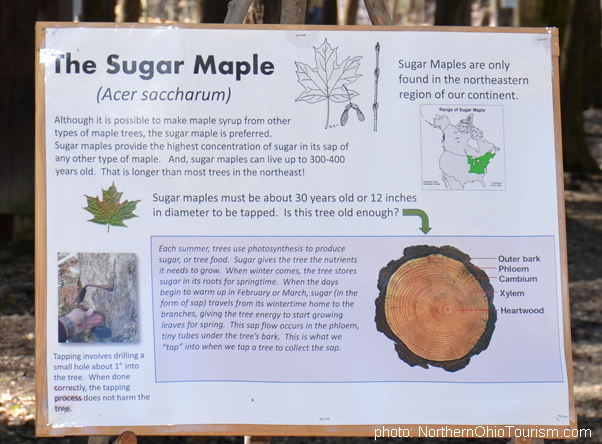 Get a sweet taste of how maple sugaring methods have evolved from the Native American tradition to modern methods during Geauga Park District's Sap's-a-Risin'! celebrations on Sundays, March 3, 10 and 17, all noon to 4 p.m. at Swine Creek Reservation! Activities include helping gather sap in the sugarbush with the help of a horse-drawn sap sled; experiencing tapping, gathering and boiling methods used throughout history; seeing sap boiling in the sugar house and tasting what's cooking; then warming up in the lodge with maple treats and live music by The Real Deal String Band (March 3), Mr. Haney String Band (March 10) or The Woodpeckers (March 17). Fun for the whole family in the sugarbush — and entirely FREE! Join us! Psst...! Excited to celebrate maple sugaring season? Consider adding our Tree Tapper's Ball to your calendar on Saturday, March 9, to create more lasting memories for the whole family! Registration opens February 25. Details at www.geaugaparkdistrict.org. Help gather sap the old fashioned way as we hitch up the horses. On Saturdays horses go out thru out the dat 11am-2pm. Sundays the horses only go out at 2pm. They do not take the horses out in heavy rain. Sample syrup and enjoy coffee, candy and other treats made with maple syrup. Shop in the 1820's Log Cabin. One of the first signs of spring is the sap running in the maple trees. Join us for an evening of good wine, food and maple sugaring. Take a tour of our sugar bush and learn how maple syrup is made on the professional and backyard level from a Farmpark maple sugaring specialist. 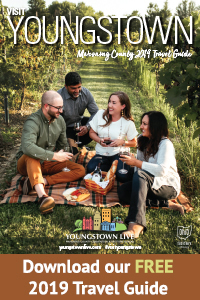 Then, enjoy a delicious meal prepared by J&J Catering with wine pairing by Debonné Vineyards! Dinner includes mixed greens with maple dijon vinaigrette, maple bourbon glazed chicken over green beans and roasted sweet potatoes followed by a delicious maple-themed dessert. A vegetarian option is available. 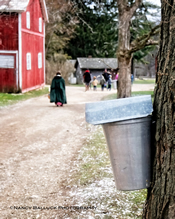 Activities include: Tap a maple tree by hand, sample maple syrup, gather buckets with fresh sap and pour it into a horse-drawn sap collector, see how maple candy is made, create a maple craft, and more. Time: 9am-1pm, with seatings at 9am, 9:45am, 10:30am, 11:15am and Noon. This year's breakfast menu includes unlimited multigrain, blueberry, regular, gluten-free and chocolate chip pancakes; as well as vegetarian and traditional sausage; roasted red skin potatoes; fresh fruit salad; and sweet maple, blueberry, triple berry and sugar free syrup. Please indicate date, time and number of meals (and any vegetarian or gluten-free meals) when making your reservations. Advance reservations are required; seating is limited. Member tickets are $11 per member adult, $6 per member child 3-12, children 2 and under, free. Nonmember tickets are $18 adults, $10 children 3-12; children 2 and under, free. Advance registration is required. Tickets are on sale through March 27. Join Naturalist Nick Parish on a hike that will include a stop at the maple syrup making demonstration put on by the Rocky Ridge Neighborhood Association. Call Ford Nature Center, 330.740.7107, for details. Moderate, 2 mi. “Come and see sap boiling into maple syrup. Take a walk in the woods and see the tubing collection system. Enjoy some hot maple syrup straight from the evaporator on vanilla ice cream. 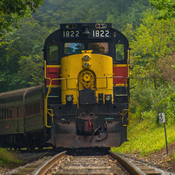 Old fashioned mapling demonstrations, wagon rides, displays and more. Enjoy a delicious pancake breakfast made by the Boardman Rotary Club in the Lariccia Family Community Center. Event is free, breakfast is $6.00. Ages 6 and under are free. Join us as we take a wagon tour of the Fulton family's Maple Valley Farm sugar woods, owned and operated by five generations of the Fulton family. See the entire syrup making process from gathering the sap to boiling and bottling in the sugar house. Tours will begin and end at Buffalo Creek Retreat where you can enjoy your pancake breakfast and warm refreshments! Space is limited for this event. Registration ends March 12. You will receive a confirmation notice by March 16 via email of your tour time and details regarding the event. We will do our best to place you in your first choice time slot, but tours will be scheduled on a first-come, first served basis. Location: Chatham VFW Hall, 6299 Avon Lake Road, Chatham, Ohio. All-you-can-eat freshly ground wheat pancakes and sausage ($). Includes coffee and water. This is a major fund-raiser for Chatham Township. Learn all about maple syrup from our Sugar Maker- Jason. Tours are available at 10 am, 1 pm, and 4 pm; but the sugar house is open to visitors from 9-5. Experience sugar camp with live historical demonstrations, horse drawn wagon rides, food and maple products for sale. Free event open to the public. • Top off your visit with a meal of pancakes and maple syrup. Visit the Sugar Store for maple products, including maple candy and more! Come join us for the Spring 2019 Pancake Breakfast at MAPS. No coupons or discounts accepted for this special event. $10.00/Adult and $6.00 for children under 12. Includes access to all of the museum. Breakfast served from 8AM to 1PM. The museum will remain open until 4PM. You get to eat and tour! A Veterans Outreach Table will be available, sponsored by the Stark County Veterans Service Commission at the event. We will also be collecting canned goods during the event to donate to our local Ohio National Guard Food Pantry. We, and they, appreciate your donation. Just bring your donation in with you. Cash accepted also. The MAPS Air Museum is a not-for-profit organization. Your participation at our breakfast and other events helps us raise money to keep the museum open. *Presale reservations are good for any One Day. Tickets are also available at the door on event days. Enjoy a hearty pancake breakfast and then head out into the Sugaring Camp to learn about tree tapping, the maple sugar process and experience oxen demonstrations. View period arts and crafts such as glassblowing, blacksmithing, pottery and spinning and weaving. Breakfast served: 10 am – 3 pm (Hale Farm closes at 4 pm) Includes, pancakes, sausage, fruit, coffee & juice. Click here to see kit. Pancakes, sausage, apple sauce, beverage. "Visit our farm to watch and learn about the sugaring process, take a hayride to the maple woods, and taste our food (donations accepted). We have 300+ trees and a wood-fired evaporator. There will be kids' activities, hot drinks, and maple syrup samples." Directions to the sugarhouse: 1.5 miles south of SR 20 (Central Avenue), next to Harrison Lake State Park. 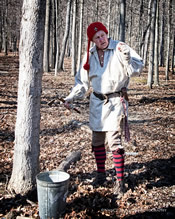 Admission: Maple Sugarin' is free -- no registration required. Refreshment will be provided for a donation. Time: Saturday, March 16th from 8am-2pm and Sunday, March 17th from 8am-1pm. Activities include a wagon ride through the Sugar Bush, a sap extraction and syrup production demonstration, free samples, living history displays, vendors, live entertainment, shopping, kids activities and a delicious pancake & sausage breakfast. Event is free to attend. Breakfast is $7 per adult and $3 per child for all you can eat pancakes and sausage with REAL maple syrup!!! All proceeds benefit the ILDC Sugar Shack Renovation project and the Fox Island Playground Fund. For more details on becoming a vendor, contact Brenda Moots at 937-842-1934. Pancake and sausage breakfast in celebration of March being Developmental Disabilities Awareness month. This breakfast is a joint effort with the Port Clinton Knights of Columbus #1750. Pancake and sausage breakfast, horse-drawn wagon rides, tree tapping demonstrations, wildlife exhibits, beekeeping, sawmill demonstrations and more. Learn the history and process of maple sugaring as you meander down the paved trail toward The Arboretum’s Log Cabin. Inside, docents greet you with a warm fire and a taste of syrup as you learn how the evaporator works. 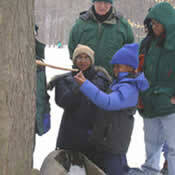 The Arboretum also offers private, group tours of the Maple Syrup Trail perfect for clubs or school groups. Email education@dawesarb.org for pricing and availability.